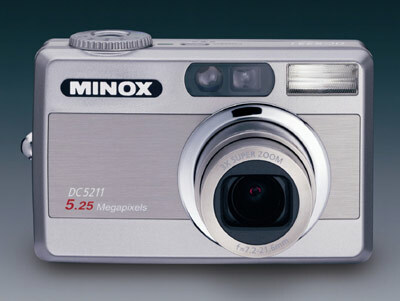 The MINOX DC 5211 with 5.25 megapixels is a compact and high-performance camera for the discerning amateur. Equipped with an elegant metal body, cleverly thought out operating controls and a feature allowing video and voice recording, this camera is ready for every occasion and opens up new realms of photography. This digital highlight from MINOX has a CCD image sensor with 5.25 million pixels. The high-performance, fast MINOCTAR lens with multiple coating and 3x zoom boasts an autofocus feature. Freely selectable shutter speeds and apertures give the photographer freedom for creative picture composition. Thanks to the individual adjustment to the 5.25 megapixel sensor, and in coordination with the electronics and software of the MINOX DC 5211, the MINOCTAR lens provides highly dynamic images with natural colour rendition. The automatic white balance ensures the right exposure, even in difficult light conditions, so that the user always has natural colors and the correct setting for the subject in view. Also the four flash functions provide optimal adjustment of the shot to the outside conditions. In spite of its compact dimensions the MINOX DC 5211 has a 1.5" TFT color monitor which allows the immediate assessment of the image during and after the shot. The use of SD memory cards of up to 256 MB guarantees maximum flexibility. A fast image sequence and minimum shutter release delay permit spontaneous candid photography in any situation. A USB interface on the MINOX DC 5211 ensures uncomplicated transmission of the image files to the computer. The pictures can be digitally touched up using the provided software and sent on by e-mail. Based on the precision detail and pin-sharp definition outstanding enlargements can be made from the images – even in large formats. Extremely compact dimensions (93 mm x 35 mm x 58 mm) make the MINOX DC 5211 the ideal companion for every occasion. The sturdy all-metal body emphasizes the timeless elegance of the camera. The scope of delivery includes 2 rechargeable Li-Ion batteries, 32 MB SD Card, a case, wrist strap, USB cable, video cable, CD-ROM and user’s manual. 10 sec., 2 sec., 10+2 sec., Interval up to 10 sec. 93 x 35 x 58 mm / 3.7 x 1.4 x 2.3 in. approx. 170 g, 6.0 oz.